We live in a time where any kind of human expression is considered art. Any teenager who manages to make an ashtray out of clay is acknowledged as an artist. That’s why, many times, art loses what’s sacred about it and turns into another consumer product, with no meaning at all. But characters like Vincent Desiderio make me feel that there is still people who search for the transcendent and it is worth to be called an artist. To become one, the painter studied arts in the USA and Italy and now is the senior critic of the New York Academy of Art. His hyperrealistic paintings reflect dreamy scenes of characters in strange postures and motifs like sickness or death are common. 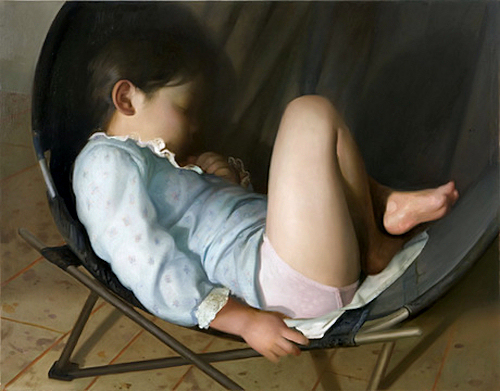 But also, Desiderio is capable of portraying a tender scene like Lilly in a round chair. Along with his wife, the artists adopted Lilly in China when she was only 18-months. Here, we see her sleeping curled up in a modern design chair. An excellent technique is shown along with the soft play of lights and shadows in the painting. Through hard work, Desiderio can transmit the pleasant sensations caused by a subtle and ethereal instant. When I take a look at your website in Safari, it looks fine however, when opening in I.
E., it’s got some overlapping issues. I merely wanted to provide you with a quick heads up! Apart from that, wonderful website! issues stepping into yohr tylical family physician. to drink. With this particular explained, it merely implies that you need a chest piece which is tuned for a certain human body audio. It can’t get you home on a night out, it can’t pull double duty as a camera on holiday and it can’t be a commuter’s boredom destroyer without a top up during the day. Other features include his love for Supreme and what makes the brand’s Nike collaborations special, among other things. This entry was posted on March 10, 2011 at 11:22 and is filed under Realism.You can follow any responses to this entry through the RSS 2.0 feed.You can leave a response, or trackback from your own site.